The name of Jerusalem (Yerushalayim) means "to see peace. The City of Jerusalem is mentioned over 600 times in the Hebrew Scriptures; over 140 times in the New Testament; and zero times in the Koran. The city has a history that goes back as far as the 4th millennium BCE, making it one of the oldest cities in the world." Jerusalem is also referred to as Salem, Moriah, and Mount Zion in the Bible. The city of Jerusalem is first mentioned in Joshua 10:1, approximately 50 years after the Israelites left Egyptian slavery, crossing through the Red Sea, and finally entering into Canaan. According to Jewish midrashic teaching, Jerusalem was founded by Abraham's forefathers Shem and Eber. In Genesis 14:18, Abraham met Melchizedek, the king and priest of Salem - the king and priest of 'peace.' Later in Genesis 22:1-19 we read about Abraham and Isaac preparing to sacrifice at Mount Moriah - site of the present Temple mount. According to Books of Samuel, Jerusalem was controlled by the Jebusites. Approximately 3,000 years ago, King David of Israel defeated the Jebusites and captured the city of Jerusalem and it became known as the City of David. "If I forget you, Jerusalem, may my right hand wither away! the greatest of all my joys." When King David desired to build a Temple to Adonai, God told him he could not build it because he had too much blood on his hands. So David's son, King Solomon built the First Temple in Jerusalem on Mount Moriah. When the ten northern tribes of Israel broke away from the two southern tribes, Jerusalem became the capital of the Kingdom of Judah. On the 9th of Av, 586 BCE, Nebuchadnezzar king of the Babylonians destroyed the city of Jerusalem and the First Temple. The city and temple were later rebuilt under the authority of Cyrus and Zerrubabel. King Herod the Great, ruler at the birth of Yeshua, enlarged the Second Temple around 19 BCE. The Second Temple was destroyed by the Roman commander Titus during the 66-73 CE siege of Jerusalem during the First Jewish Revolt. The Jewish historian Josephus records that 1,100,000 people were killed during the siege. Many fled to areas around the Mediterranean. The Romans hunted down and slaughtered entire clans, such as descendants of the House of David, and Titus condemned 2,500 Jews to fight with wild beasts in the amphitheatre of Caesarea in celebration of his brother Domitian's birthday. 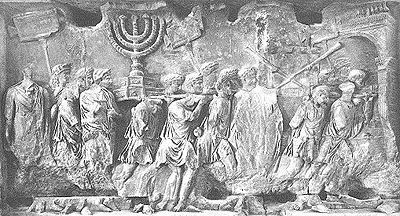 The City of Jerusalem was again attacked by the Romans in 132-135 CE during the Second Jewish Revolt and Jews were killed and forced to flee from Judea to areas outside the Roman Empire into the Jewish Diaspora (dispersion). The Romans changed the name of the City of Jerusalem to Aelia Capitolina, and renamed Judea to Palaestina. 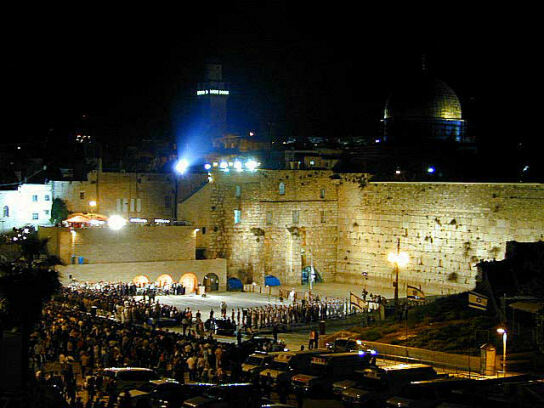 Jerusalem is the most contested and sought after city in all of history. Many nations and peoples have come against it: Assyrians, Egyptians, Babylonians, Greeks, Romans, Byzantines, Persians, Arabs, Crusaders, Mamelukes, Turks, Britons, and Jordanians. If this were only a physical battle, it would be hard to understand the reasoning behind this. However, the heart of the battle is spiritual. God has declared that Jerusalem shall be His Throne (Zechariah 8:3). His Word has proclaimed that He will reign in Jerusalem forever. This fact is well known by Satan. Even from the beginning, Satan declared that he would sit on God's Throne (Isaiah 14:13). In rebuking Satan, Adonai even mentioned that He had chosen it: "And Adonai said to Satan, 'Adonai rebuke you, Satan! Indeed, Adonai who has chosen Jerusalem rebuke you!" (Zechariah 3:2). When Adonai was moving Israel into the Land from Egypt, it was Amalek who attacked the women and children, striking from the rear (Exodus 17:8-16). Seeing the true spiritual battle, Moses stated that there was "a hand on the throne of Yah." The importance of Jerusalem lies in its spiritual aspect, not its physical makeup. It is a city that lives and responds to the Holy One of Israel. God declares to Ezekiel how He had mercy on Jerusalem, how He blessed her and made a covenant with her (Ezekiel 16.6-14). Jeremiah laments of her misery and suffering after God judged her (Lamentations 1.1-22). Yet God declared that He will not forget Jerusalem; He will establish an everlasting covenant with her (Ezekiel 16.60-63). Jerusalem is the center of the earth, according to Adonai (Ezekiel 5.5). Its very existence continually proves that there is a God and that He will judge every man and hold him accountable for his deeds. 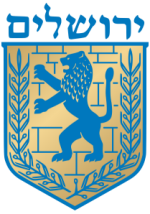 On November 29, 1947 - six months before the declaration of the State of Israel - the United Nations passed Resolution 181. One of the main points of this resolution was the establishment of Jerusalem as a "corpus separatum" (a "body of separate covenant"). This means, basically, that the UN separated the city of Jerusalem from the rest of the world and created a separate covenant for it. This has never been done before in all of history. In 1950, the U.N. adopted the "Statute for the City of Jerusalem" setting forth the regulations for the administration of the City of Jerusalem by the United Nations. It would be an "international city." 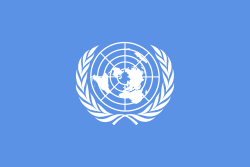 It would not be linked to or controlled by any nation or government except the United Nations. Why would the world be so concerned about an ancient city like Jerusalem? It is located approximately 27 miles inland from the coast. It has no natural resources. Most of it is built upon the ruins of previous structures. What makes it so important that the United Nations would set it apart from any other city or nation in the entire world? The interesting aspect is that Jerusalem has never been important to the nations unless it was important to Israel. When Israel started to return to the Land in large numbers during the late 1800's, the nations began to stir. It was just a little more than 50 years later that the U.N. adopted it’s "Statute for the City of Jerusalem." Thirty-five years ago, on 28 Iyar 1967, during the Six-Day War, Israel regained control of biblical east Jerusalem, including the Temple Mount. Israel, for the first time in more than 2,000 years, was in complete control of the entire city. Within a few days, Defense Minister Moshe Dayan gave control of the Temple Mount back to the Moslems, while maintaining Israeli sovereignty over it. 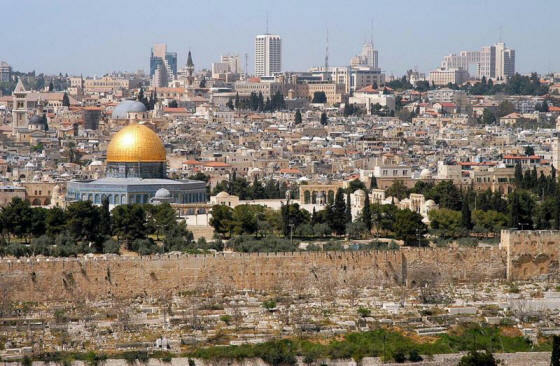 In 1980 Israel adopted a "Basic Law" that declared that Jerusalem was the capital of Israel. If this had happened in any other nation, it wouldn't have garnered much attention from the rest of the world. But it didn't happen in just any other nation. It happened in the nation of Israel, and the entire world responded in an uproar. On June 30, 1980, the U.N. Security Council passed Resolution 476 by a vote of 14-0 with one abstention - the United States. It stated that it was "gravely concerned about the legislative steps initiated in the Israeli Knesset." And the resolution was a general denial of Israel's right to Jerusalem. Later that same year, on August 20, the Security Council passed Resolution 478. The vote, again, was 14-0 with one abstention - the United States. This resolution censured "in the strongest terms" the enactment by Israel of the "Basic Law" on Jerusalem. It stated that the enactment of the "Basic Law" constituted a violation of international law. Israel is seen as the "occupying power" in the Land. Resolution 478 has been repeated by the General Assembly every year from 1981 through 1987. God has declared that Jerusalem is the place from which He will reign: "At that time they shall call Jerusalem 'The Throne of Adonai'" (Jeremiah 3.17). It is to Jerusalem that Yeshua (Jesus) will return in the Glory of the Father (Acts 1.11; see also Ezekiel 43.1-4). Adonai said He was "exceedingly jealous for Jerusalem" (Zechariah 1.14). Many of the prophets spoke of Adonai's return to Jerusalem. Adonai declared through Zechariah, "'I will return to Jerusalem with compassion; My house will be built in it', declares Adonai of hosts" (Zechariah 1.16; Zechariah 2.12; 8.3). More than 4,000 years ago Abraham understood the importance of the city when he declared that Mount Moriah, in the midst of Jerusalem, would be "the place where God will be seen" (Genesis 22.14). Yet God also declared that Jerusalem would be a problem for the nations of the world: "Behold, I am going to make Jerusalem a cup that causes reeling to all the peoples around; and when the siege is against Jerusalem, it will also be against Judah. And it will come about in that day that I will make Jerusalem a heavy stone for all the peoples; all who lift it will be severely injured. And all the nations of the earth will be gathered against it." Adonai also gave warning of His judgment against those who come against Jerusalem: "And it will come about in that day that I will set about to destroy all the nations that come against Jerusalem" (Zechariah 12.9); "Now this will be the plague with which Adonai will strike all the peoples who have gone to war against Jerusalem; their flesh will rot while they stand on their feet, and their eyes will rot in their sockets, and their tongue will rot in their mouth." Does this scenario sound familiar? It should. It is happening in our very day. Literally all of the nations of the world are gathering against Israel. The line has been drawn in the sand. It is the people of the God of Israel standing against all the nations of the world. Whose side will you be on? This is not the time to be straddling the fence. Now is the time to make a stand. Pray for the peace of Jerusalem, for through her peace will come the peace of the world. Take a stand for the Kingdom of God and see the salvation of Adonai. Yeshua spoke of the Jewish remnant being driven into all the nations in Luke 21. He also spoke of Jerusalem being "trampled under foot by the Gentiles until the times of the Gentiles be fulfilled." On the morning of June 7, 1967, Jerusalem was retaken by Israel. However, the prophecy spoken by Yeshua was not entirely fulfilled at that time. There is still one part of Jerusalem that is not completely under Israeli control: the Har haKodesh - the Holy Mountain. Yeshua warned in Matthew 24:15 about the “abomination of desolation that would stand in the holy place,” referring also to the prophecy in Daniel 9:27. The prince of Islam has fulfilled both those prophecies by defiling the most holy place with a veil covering over the entire mountain. However, Adonai has declared He will remove this covering: "And on this mountain He will swallow up the covering which is over all peoples, even the veil which is stretched over all nations" (Isaiah 25:7). The sanctification of the Har Hakodesh is the final step in fulfilling the prophecy spoken by Yeshua. Jerusalem truly is a "corpus separatum". However, it is set aside by Adonai, not by the United Nations. Adonai declares, "Behold, I am going to made Jerusalem a cup that causes reeling to all the peoples around" (Zechariah 12:2). He also said that He would put hooks in the mouths of all the nations and draw them into war against Israel (Ezekiel 38:4). The nations are beginning to gather against Israel, specifically Jerusalem. It is only a matter of time before the UN resolutions are enforced. All of the actions currently being taken by the UN are only preparations for the final conflict with Israel. We have been appointed watchmen on the walls of Jerusalem (Isaiah 62:6-7). To the one who is a real follower of Messiah Yeshua, Jerusalem should be a primary concern. Yeshua set His face toward Jerusalem and spoke prophetically in Matthew 23:37-39, “Jerusalem, Jerusalem. You kill the prophets. You stone those who are sent to you. How often I wanted to gather your children, just as a hen gathers her chickens under her wings, but you refused. Look! God is abandoning your house (Temple), to you, leaving it desolation. For I tell you, from now on, you will not see me again until you (Jerusalem) say “Baruch HaBa B’Shem Adonai.” Which translated is, "Blessed is he who comes in the name of Adonai." Yeshua was giving the first clue about his second coming. The residents of Jerusalem and Judea will proclaim “Baruch HaBa B’Shem Adonai.” Then they will see and know their Messiah – Yeshua. Yeshua stated later in Mathew 24:33 that "When you see all these things, recognize that He (Messiah) is near, right at the door." Zechariah 14:4 states that when Messiah returns, he will stand on the Mount of Olives, overlooking Jerusalem. 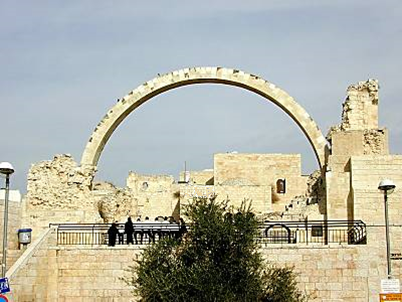 The Moslems have walled up the Golden Gate in the walls of Jerusalem and placed a Moslem cemetery in front of the entrance to block the Messiah from entering the Holy City when he comes back. But the God of Abraham, Isaac, and Jacob will have the final word and Messiah will reign over Jerusalem. prepared like a bride beautifully dressed for her husband. I heard a loud voice from the throne say, ‘See! and he himself, God-with-them, will be their God. Parts of this article are from tzemach.org and used with permission.